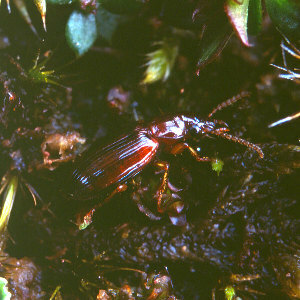 Description: A 3.8-4.2mm long dark reddish to black ground beetle living in litter under heather on sandy or peaty soils. Common near the coast and on upland peat. World Distribution: A European Wide-temperate species (63) recorded mainly from southern and western Europe, between extreme southern Fennoscandia and Iberia, and extending east to the Caucasus. Irish Status: Widely distributed in both upland and lowland habitats. Ecology: Recorded widely on peaty substrata or on coastal heaths and stabilised, acid dunes. Also occasional on dry banks in gardens and agricultural land.